We went 2-1 in Week 17 to close the season on a 6-2 run. Baker Mayfield and the Cleveland Browns (+6) were the gifts that kept on giving for PFF and PFF Greenline, coving the number in their last game of the season. While the number of games at playoff time is reduced by a factor of four, we think that there’s some value here upcoming. With the Browns (+6) pick hitting, we’re 23-18-1 on our “Lock of the Week” picks since the start of 2017 (56.1%). We’re 80-73-7 (52.3%) on all of our picks since the beginning of 2017 and 62-50-5 against the spread (55.4%). Our Las Vegas SuperContest picks went 48-36-1 (57.1%) this year (team name #Bet Against___). 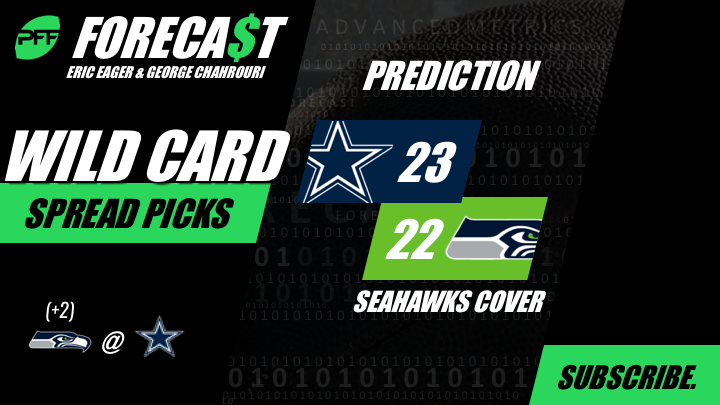 Follow us on Twitter at @PFF_Eric and @PFF_George, and for some podcast commentary on some of these picks, and the process that goes into them, give the PFF Forecast a listen. We will have a special Monday morning podcast each week with look ahead lines for the upcoming week. Point (Eric Eager): For the second time in as many seasons, we’re picking the Seahawks in Dallas as underdogs. The last time we did so, Russell Wilson went 14-21 for 92 yards in a 21-12 win in which the Seahawks gained just 136 total yards of offense. What’s changed is that Wilson has been, play-for-play, one of (if not the) best quarterback in the NFL, generating a big-time throw rate around 7%, versus a turnover-worthy play rate of around 2%. It’s well-documented that Tyler Lockett (a guy we loved coming out of Kansas State) is eliciting a perfect passer rating on his targets this season, but Doug Baldwin has also been very good himself, averaging 2.61 yards per route run since returning from injury. What hasn’t changed since the last matchup in Dallas (or, frankly, the most recent matchup in Seattle) is the play of Dak Prescott who, despite a great effort in securing the Cowboys’ 10th win on Sunday, has been decidedly average this season. While earning a cluster-3 rating in our algorithm, he’s generated just +0.04 EPA per dropback and less than a 3% big-time throw rate. This has improved since the acquisition of Amari Cooper, but as we’ve seen the last three weeks (where Cooper has gained just 81 total yards), he can be effectively shut down even against defenses like the Colts, Bucs and Giants. If Seattle can stop the Cowboys running the football on early downs (and have success there themselves), look for the better quarterback getting points to fulfill the prophecy of the proverb in this one. Counterpoint (George Chahrouri): Chicks dig third-down conversions, but if you’ve ever read this column before you know we take a vow of celibacy during football season for a reason. What a team does on first and second down is where the money is really made, and those two downs give the Cowboys hope. The Seahawks are the 29th-ranked offense on early downs using EPA per play allowed and have allowed a league-high 6.2 yards per play on those downs. The Cowboys can leverage this to trade third-and-long situations where they rank 23rd in the NFL for third-and-short where they rank eighth. Dak Prescott simply isn’t close to a Russell Wilson and making him a pure dropback passer is a recipe for disaster in big D.
The Seahawks like to give out early down goodies (not my goodies) on both sides of the ball. They run the ball 56% of the time on first and second down, by far the highest in a league where the Tennessee Titans (52%) also exist. (Queue an angry Seahawks fan trapped in a box held by a blindfolded Brian Schottenheimer). The Seahawks rank 20th in yards per play on early downs overall and eighth in yards per early-down passing play (Russell Wilson is good at football). Should the Seahawks continue to limit their biggest advantage in Wilson, the Cowboys have a chance to get the job-cementing win that Jason Garrett so desperately needs. Point (GC): The. Better. Quarterback. Is. Getting. Points. While I was – and still am – a huge Lamar Jackson fan, the idea that he should be favored against Philip Rivers is a bit laughable — almost as laughable as thinking about the Ravens with Joe Flacco at quarterback. The much ballyhooed Ravens run-a-thon has not exactly created the world’s most impressive offense. Baltimore ranks just 19th in early-down yards per play since Jackson took over in Week 11, while the defense has faced right around the league average number of plays and the 10th-most drives in that timeframe. Jackson has been rather volatile considering the run-heavy scheme, he has the highest rate of turnover-worthy plays of any quarterback in this round and is throwing uncatchable passes at the third-highest rate (behind only Josh Allen and Josh Rosen). Rivers had a day to forget against the Ravens on the worst home-field in the NFL. He was under pressure on 55% of his dropbacks, a season-high and a far cry from his average of 35%. Even for a man with 17 children, that is a lot of pressure to face in your own home. It would be foolish to let a single game cloud our judgment of this matchup. Rivers, Allen, Bosa and the Chargers are the better team with the superior player at the most important position, don’t overthink it. Counterpoint (EE): In their December 22nd matchup in Los Angeles, the Ravens did many of the things we thought they couldn’t do consistently to beat the Chargers handily on the road. Lamar Jackson made just enough throws to keep the Chargers’ defense honest, and they were able to take advantage of a defense allowing over 40% of early-down runs to have success (fourth-worst in the AFC). Their defense, which let down a bit mid-season against some better opponents, stood tall against one of the league’s best offenses and quarterbacks in the face of what we said (which was that defense isn’t terribly predictive). The Chargers already slow these games down significantly from a possession standpoint (63.4 offensive snaps per game), and while that should benefit them being field-goal dogs against the Ravens, it might prohibit their opportunities to come back and win/cover should they get behind early (as they have in recent weeks against Pittsburgh and Kansas City) and have to come back against what is a ferocious Ravens defense that is allowing a league-best success rate on early-down passes.